Located out in Coconino County in the northern central part of the state, Flagstaff is one of Arizona's most popular cities with workers, residents, and tourists alike. It’s in a particularly beautiful part of the state, with the San Francisco Peaks and Colorado Plateau not far away and the highest point in all of Arizona, Humphreys Peak, also being in close proximity. There are some beautiful pine forests in the surrounding area, along with lava tubes and lots of wildlife, so Flagstaff really is a nature lover’s paradise. Generations of people who like to spend time outdoors have all fallen in love with Flagstaff over the years, with so many amazing outdoor recreation areas and opportunities to be enjoyed all around the city. It’s even nicely situated for trips to the Grand Canyon, with the iconic National Park less than 80 miles away from this city. The likes of Walnut Canyon National Monument and the Sunset Crater Volcano National Monument are in the local area too, and the city itself is home to some interesting attractions of its own like the Lowell Observatory, the Arizona Snowball, and the Museum of Northern Arizona. All in all, Flagstaff is a city with a lot to offer, so it’s no surprise that many people want to visit this location. If you’re planning a trip to Flagstaff too, you might want to consider staying in one of the city’s hostels. The hostels of Flagstaff represent a great way to cut down your travel costs and save money, which can then be spent elsewhere around the city or saved for a future trip. These hostels provide affordable room rates, communal spaces like kitchens and lounges, and some extra amenities too, all designed to make your stay a seamlessly enjoyable experience from the first moment to the last. See below for full overviews of the best hostels in Flagstaff, AZ. One of the two main hostels in Flagstaff Arizona is the Grand Canyon International Hostel. Despite being named after the Grand Canyon, this hostel is over 70 miles away from the Grand Canyon National Park. In spite of that, Flagstaff is a popular base camp for people wishing to explore the canyon, so if you're planning a trip out to one of the world's greatest natural wonders, this hostel is a fine place to stay. This hostel is located in the heart of the city of Flagstaff, only a short walk from the closest bus station to help you get around the city with ease. You'll find some popular attractions and landmarks like the Riordan Mansion and Lowell Observatory in the local area, with the shops and bars of Downtown Flagstaff just 10 minutes away by foot, so there's a lot to do in the local area. Grand Canyon International Hostel is a laid-back hostel with free breakfast for all guests and free Wi-Fi access too, so you can keep up to date with the latest goings-on from around the world and stay in touch with family and friends via email and social media too. As for the rooms, dorms, and bathrooms, they're all clean and nicely laid-out. All in all, this is a classic sort of hostel. 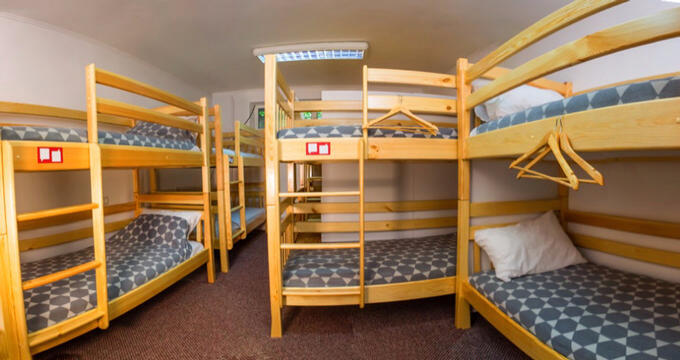 It features the sort of facilities and friendly staff you would expect to find from a good quality hostel location, including two shared kitchens and a spacious lounge with comfortable seating and rustic furniture. Another amazing hostel location in the city of Flagstaff, Arizona is the DuBeau Hostel. This hostel is just off Historic Route 66 and only a block or two away from Downtown Flagstaff, so it's an ideal option for people wanting to explore the city and visit the various museums, bars, restaurants, and shops that the local area has to offer. You'll be able to benefit from free Wi-Fi access throughout this hostel, which is a nice bonus when you consider that many hotels actually charge additional fees for internet access. Guests at the DuBeau Hostel will also be able to enjoy free breakfast in the mornings, filling them up with energy to get out and enjoy the day. The rooms and dorms here all have a lot of personality, with colorful decoration and interesting furnishings. The communal lounge space, for example, features cozy chairs and old vinyl records lining the walls, giving guests fun things to look at and helping this place feel more like a home away from home than a simple location to sleep at each night.